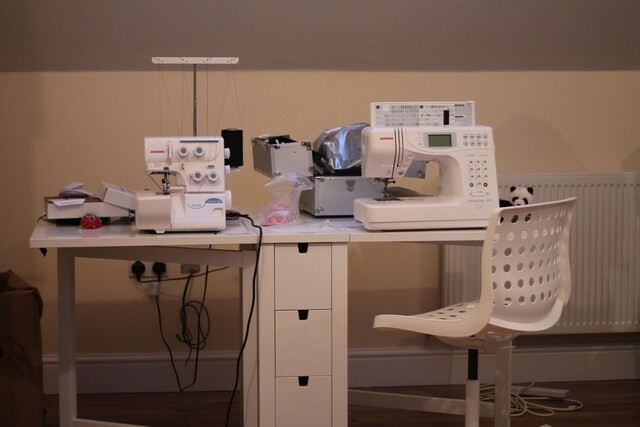 When I first started sewing I was, like many of you, on the kitchen table. Gradually, I took over a (very) small bedroom. 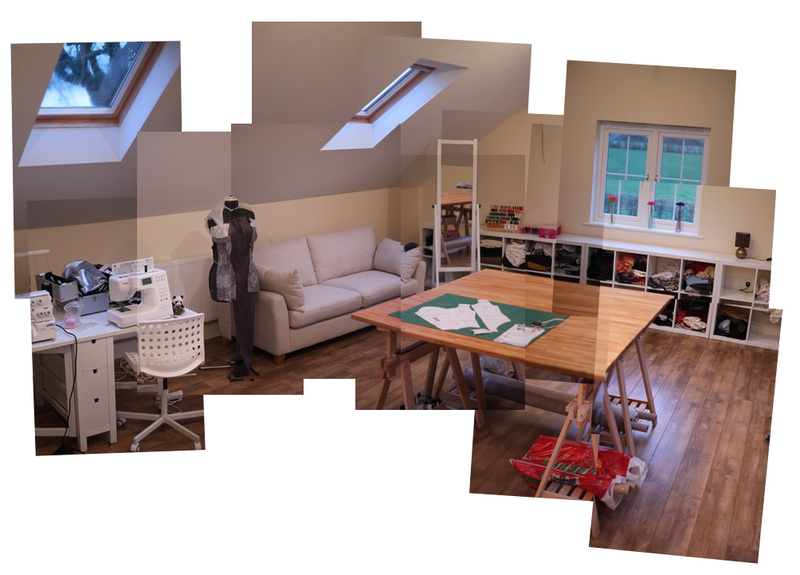 But when we moved into our dream home just over 2 months ago I also got my dream sewing space! Its located in the roof space above our garage, and not only is it spacious, it also has the most amazing light coming in from the Velux windows and is just such a luxury to come and work in. Warning: everything in the room is from Ikea, so if you don’t like flat packed furniture, move on. Ready for the tour? It is hard to show the room in one shot, so the first picture at the top of this post was “stitched” together (by my sister, who took most of the shots in this post), whilst the picture above was taken by my husband using the panoramic feature on his mobile. Anyway, thanks to both for the photography (and to Phil for putting all the furniture together). Starting over on the left hand side of the panoramic photograph, the first thing you see is a set of Malm drawers. This is where I store my patterns. FYI, one of the drawers is empty, two are about 2/3rds full and one is about 50% full. So, that gives you an indication of how many patterns I own. Saying that, these drawers can hold a lot of patterns! I swear they are not that messy! 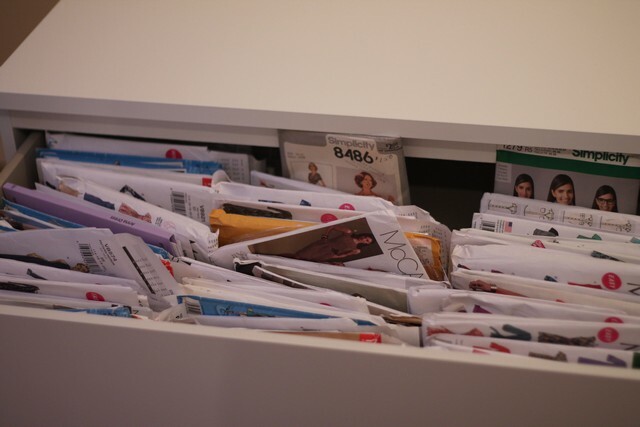 I just need to find a way to prop the envelopes up so they don’t keep sliding down if the drawers are not full. Next we have lots of Kallax Shelving Units (on both sides of the room). 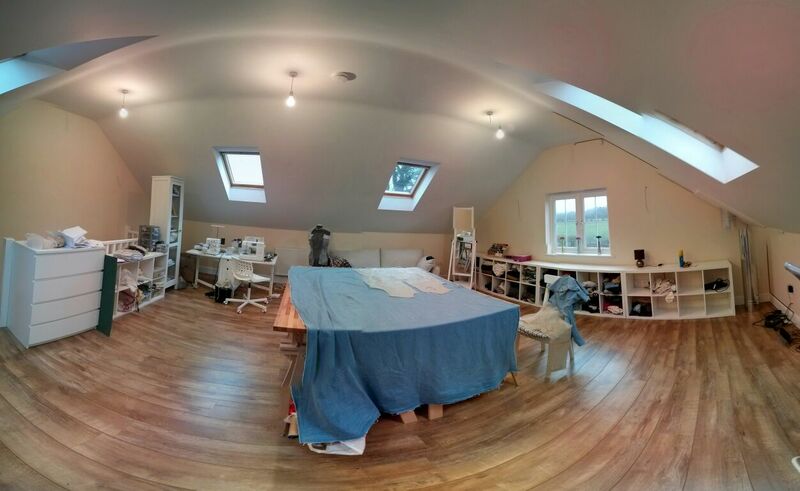 On the right hand side of the room (panoramic picture), I use the shelves to store my fabric. 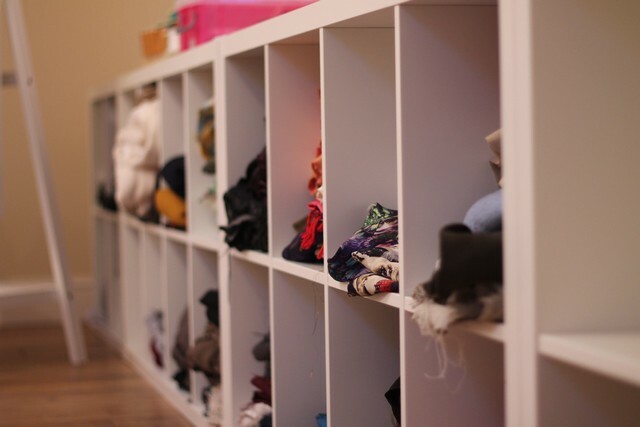 Kallax is an economical, modular system, but being honest, I chose them because I am pretty restricted height wise in this room (in terms of having storage next to the walls), so Kallax fitted the dimensions of the room. I haven’t got any drawers for the shelves yet. I thought I would wait and see how many/ what I needed. 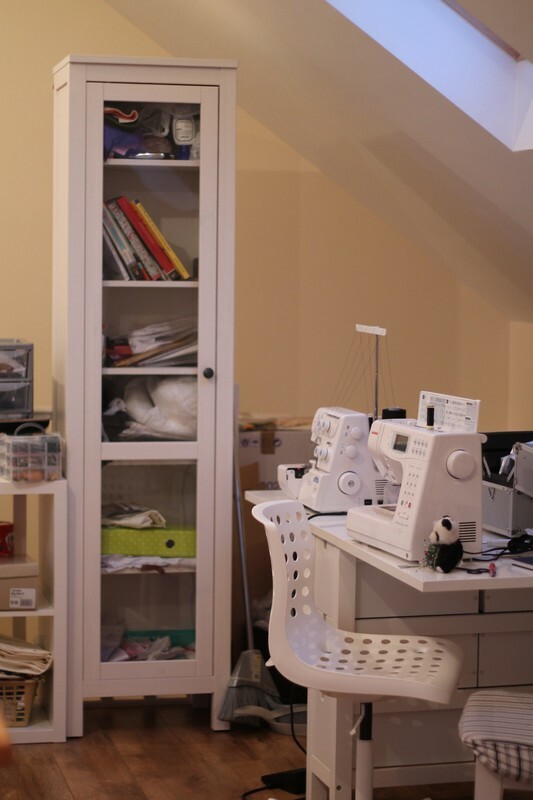 Anyway, the Kallax shelves on this left hand side of the room holds…wadding, my old sewing machine, quilting supplies. Next to the Kallax shelves you can see a Hemnes Glass Door Cabinet. This cabinet holds my sewing books, printed patterns (badly stored! ), and bits and bobs like fray check, machine oil, buttons, interfacing, tracing paper etc. Erm…still all needs a little more sorting. I just bought the chair, and I love it because it’s height adjustable, lumbar supportive and on castors so I can move between my sewing machine and serger without getting off my bottom. haha. Its the Skalberg/ Sporren. 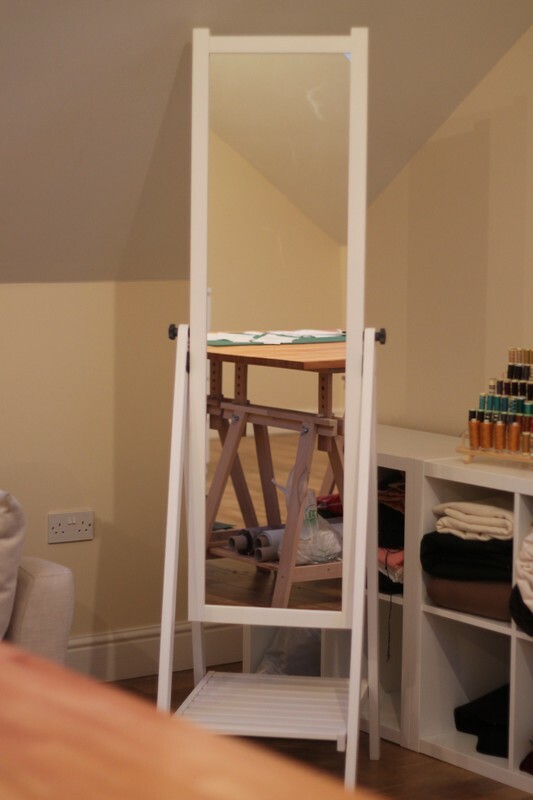 The mirror (an absolute must in any sewing room if you are lucky enough to have one, IMHO), is the Isfjorden standing mirror. Again, I chose this because I knew the sloping ceilings in this room restricted having anything fitted to the walls. 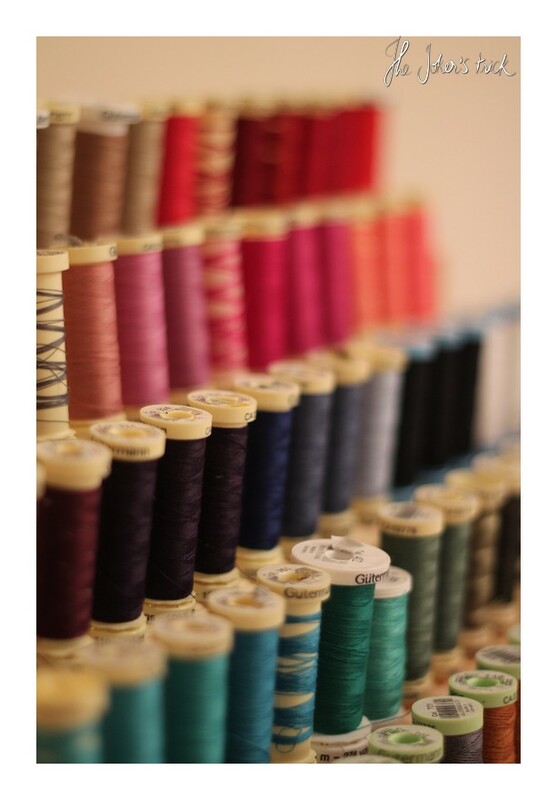 Love my new thread rack (purchased on ebay). 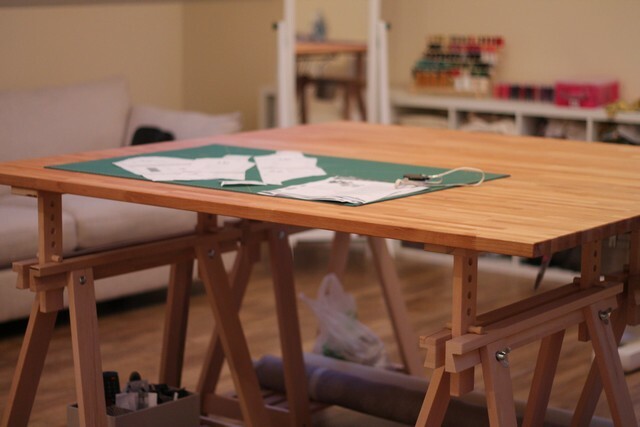 I bought the cutting table just recently too. It’s the Gerton/ Finnvard combination, (two of them pushed together), and I am so pleased with it. I have very bad lower back pain and I specifically chose the Finnvard trestles because they are height adjustable. I have these set up so that, with the Gerton table tops in place, the height is 90 cm…the same height as a standard kitchen unit here in the UK. My back is not quite as painful now I am not leaning over the dining table to cut. We haven’t fixed these in to place yet, so I can move them around if I want/ need too. The last thing I wanted to show you was under one end of the cutting table, my husband fixed a Grundtal rail and we hung a couple of Grundtal containers and S-hooks. 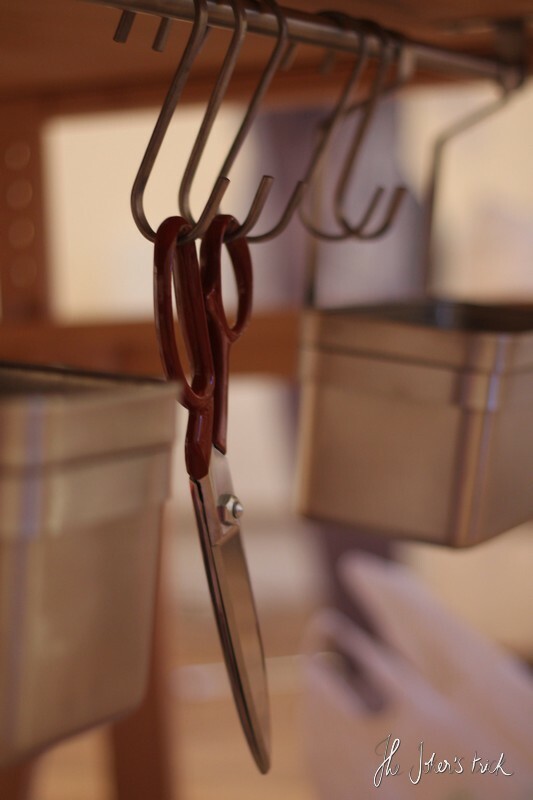 You can see my Merchant and Mills scissors hanging there (birthday present from mum), and I like to keep things to hand there that I use during cutting, like chalk, tape measure, pins etc. Happy New Year Sewing Everyone!